I often take pictures of my tour guests riding Big Thunder Mountain Railroad from this spot near the exit of the attraction. However, it is usually during the day, when the sun illuminates the faces of the guests riding by. 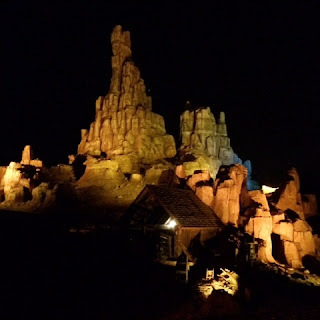 A few night ago, I found myself in Frontierland with friends and family, and I loved the way the mountain looked from this familiar angle. This is one of those attractions that really is a different experience at night.